... 1912 (100 years ago), upon the death of her father, Marie-Adélaïde (right), then 17 and the eldest of six sisters, became the 1st female leader of Luxembourg. (photo credit) Her mother served as regent till Marie-Adélaïde turned 18; thereafter, she was fully the 1st reigning Grand Duchess of Luxembourg (as well as "the first sovereign of Luxembourg since 1296 to have actually been born within the country"). 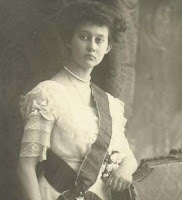 Unpopular in part because of her cordial relations with Germany during World War I, she would be forced to abdicate in 1919. Her sister Charlotte then took the throne, while Marie-Adélaïde became a Roman Catholic nun and died from influenza, in Bavaria, in 1924.